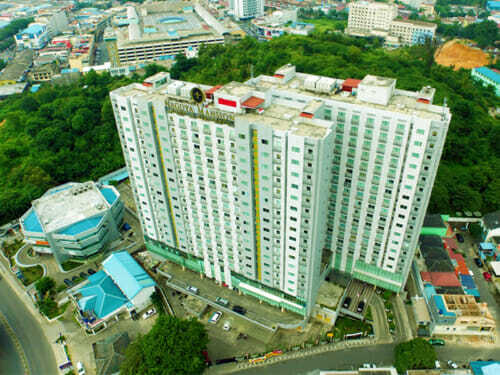 Nagoya Mansion Hotel Batam is one of most comprehensive and popular 4-star city hotels around the Nagoya Hill area. It was the first property to offer residential, hotel, and lifestyle facilities all in one compound. Nagoya Mansion Hotel Batam was featured in our review Top 5 ‘Cheap & Good’ Hotels in Nagoya, Batam. Our 2D1N Nagoya Mansion Hotel Batam package consists of a 2-way ferry tickets from Singapore, 1 night stay with breakfast, and 2-way Batam land transfers. You have the option to upgrade to a 2-days-1-night tour package that also includes a city tour with seafood lunch and 60-min body massage. Located less than 5-min taxi ride away from Batam Nagoya Hill Mall, Nagoya Mansion hotel is a suitable accommodation for leisure and business travellers from Singapore. Other nearby hotels for your consideration include the popular 3-star Da Vienna Boutique Hotel Batam and the underrated 4-star Harmoni Suites Hotel Batam. Whether you are travelling alone, as a couple, with a group of friends, or your family members, this hotel is suitable for anyone, especially if you fancy the vibrant Baloi district instead of the usual Nagoya area! 4-star Batam Nagoya Mansion Hotel has: Meeting rooms, restaurant, bars, swimming pool, fitness centre, pastry shop, concierge service, wireless internet access, spa & massage service, praying room (mushola), business centre, and more. A flat rate is applied for either a weekend or weekday stay at this wonderful hotel. Our popular Nagoya Mansion Hotel Batam Package includes 1-night stay with breakfast, 2-way ferry tickets from Singapore, 2-way Batam land transfers, and option of Batam tour with seafood lunch and body massage. It’s in the city but quite a distance to walk to Nagoya hill. Hotel is quite good, the rooms and everything. no complain..
My favourite hotel in Batam. Everyhting is good! Hotel is perch on top a hill. If you are walking to the hotel, those who have weak knees I wouldn’t recommend. Views from hotel rooms are great! Air conditioning can be improved as it takes some time for the room to get cold. Waiting for the lift can sometimes be a little slow as well. Overall, worth the price. good size pools, rooms are huge, the only complain i have is that the aircon took too long to load. hotel should look into cooling the room for guest, thus when rooms are ready, they will feel more comfortable. Breakfast is included in all our packages. You don’t have to pay anything extra for it. Pretty good hotel i must say. facilities, room, service, location. Thaks batamgetawqy for your efficient service! Will book with you again. Location is like so near but yet so far from nagoya hill mall. still need to take transport. most everything is ok at the hotel other than the breakfast. Decent, not fantastic. expected more. Mansion is a cheap 4stars hotel. On arrival the land transfers was a breeze. Hotel is perch on top of a hill so for those who have weak knees, it may be a bit difficult to go up to the hotel unless you have a transport which will drive directly to the entrance. Check in counter is located above the lobby, very small. There were only 2 lifts, very slow especially if there is full occupancy. Air-con in room took some time to be cold. Hotel staff was not polite and wasn’t at all helpful. The room we had took too long to be cold, we have to change to a different room, same result and we gave up. Initially we had a room that despite having already checked in for 2-3 hours, the aircon only blew hot air. We went down to have a change in hotel room, the staff was nice enough to accommodate to us maybe after seeing the both of us sweating.. the new room which we got was much better.